Are the revolts etc random or event spawned based off factors? 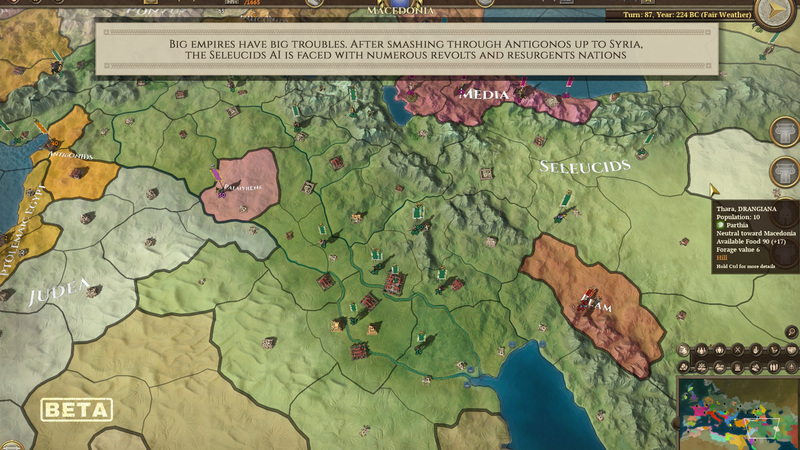 In the image, it says "after smashing through Antigonus up to Syria, the Seleucids AI is faced with numerous revolts..."
So as I understood there are two important things: 1st is the civilization level and the 2nd is the status (young, stable, gloriuos, etc) . But what I dont get is what this civilization level gives you (the player) beside the name and Golden age (republic, monarchy, tribe, empire)? Status is basicaly how you increase or decrease civilization level and nothing else? Would deffinetly like some explanation here what those 2 actually give (or take). The decadence/culture/legacy is less confusing but still not 100% understood, probably its going to be easier once I play the game but for now its a bit of a nut to crack. Is it about having your culture grow more than your decadence? And if so if the culture rises quicker than decadence than I'm on the rise in terms of a status ? Which in turn raise my civ level? I think it might be difficult to explain without actually playing the game as no matter what you write its more difficult for us (not beta testers). But in my opinion its interesting and engaging that nations who expand too quickly can end up with a heck of a problem later on if not addressed properly. @Haircuts: Revolts come from a loss of regional loyalty mostly. But regional loyalty is heavily influenced by the status of your nation and if the regions are assimilated or still resistant to changes. So by pushing hard toward Syria, the Seleucids AI had gained a lot of regions rapidly, which is generating some turmoil at the national level and many issues at the local level. This might have led to revolts and uprisings. @Yarev: Governments are split in civilization levels. So if you want to reach the Republic or Kingdom government (civ level II) or the Tribal Federation or Empire government (civ level III) you need to progress in status. Governments provide several benefits as you climb the civilization ladder. You get much more taxes from your citizens for examples, and they provide large modifiers. 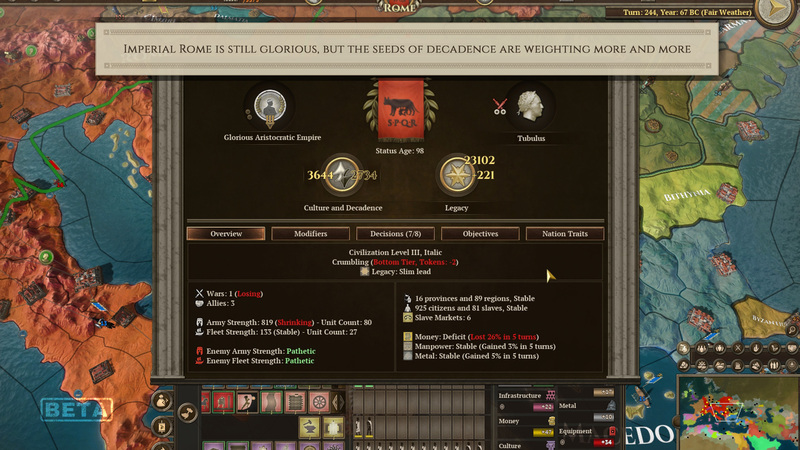 For example being an Empire provides 10 xp at start for your units and +15% Culture, which is very nice. You have access to the last tier of buildings, which are rather powerful. You get more decisions also, including military reforms. All in all, it is considered much better to evolve from civ level I to III, although doing it as fast as possible might not be recommended either. It will be a very welcome difference from the map painting and rampant blobbing that the Paradox upcoming title Imperator Rome appears to encourage. It seems we are looking at a more nuanced and thoughtful approach being needed with internal stresses and strains being just as important as threats externally. I hope it is released before Imperator, as Imperator should be a good game, but AOE, should be the better of the two. If Imperator is too complex it will adversely affect sales by being guilty via association. 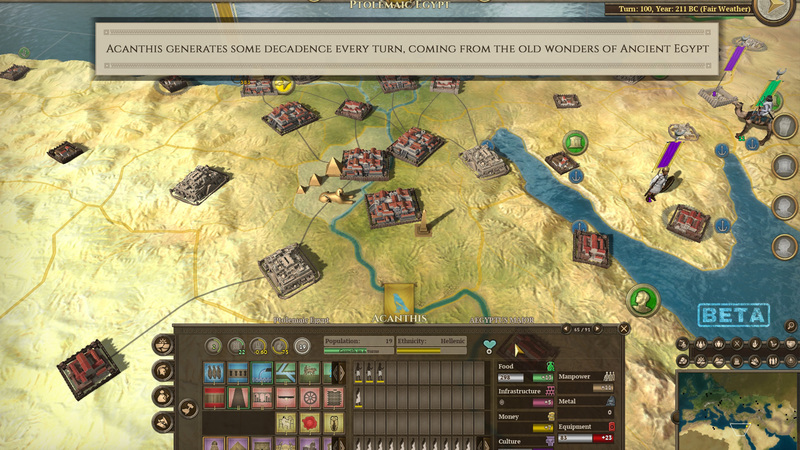 Whereas if AOE is released first and is a great game, Imperator will benefit regardless. I am right there with you, but mostly because I am selfish and want to play the game right now. 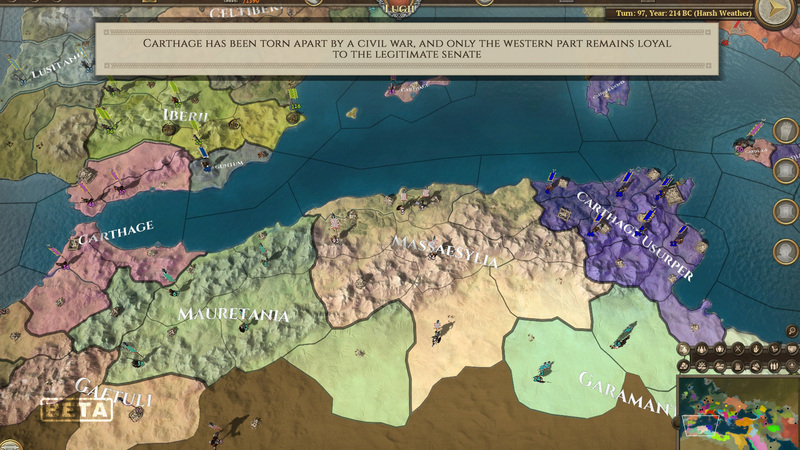 And considering that this game offers an opportunity to play high and not only wide really makes me glad as almost no grand strategy games offers that. The decadence and culture mechanisms seem likely to give good feel and lots of possible mechanisms. Does the system encompass the long stability of Sparta under a rather totalitarian approach focused on maintaining itself as a static society and an active power.power? Are the successful tools of empire - especially the Persian ones, reflected in game? Then there is Rome, which faced varied threats and pressures pressures for changes and had revolutionary events and civil wars, but somehow avoided completely falling apart for a millennium and civil from time to time and continued to echo through history. As also the fractious Greeks. The mechanics of the game and it's choices mean that those specific empires can indeed exhibit those traits if the player makes choices appropriate to those paths but they are not in any sense predetermined (it would be a poor game of they were).